The following close-up aerial photo of the pontoon taken in September 2010 by NearMap will assist the reader in appreciating the PowerPoint titled Farewell to the Pontoon. This following PowerPoint shows graphically the height of the flood and its devastating impact in terms of its removal of soil and our pontoon. 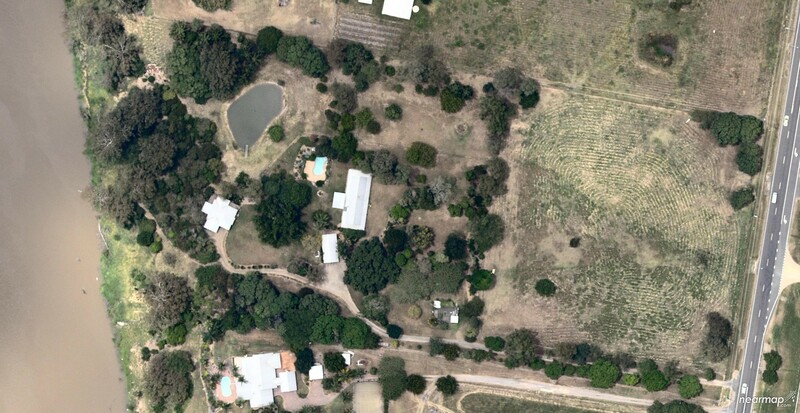 Alternatively click on the subsidiary page called Gallery of the Pontoon’s Short Life which is a subsidiary of The 2011 Flood at Moggill page on the Menu. There was a similar loss of soil in another longer section of our river frontage. If you are interested in the erosion that occurred there and the measures that are being taken to stabilise the riverbank and hopefully prevent further erosion in the case of another flood then please refer on the Menu to the Land For Wildlife page (subsidiary of Wildlife page) and scroll down to Assistance with erosion after the flood where there is a description and photos of the steps that were taken. 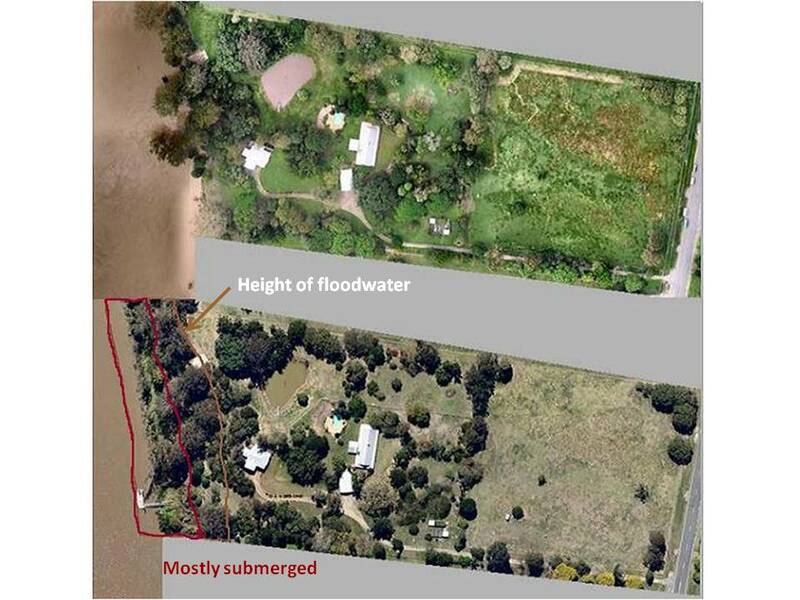 The following aerial photographs will give a better understanding of the severity and extent of the flood. and provides a comparison of the bank when it was flooded and before the flood. moreover, the flood deposited a layer of sand along the river where the mangroves had been growing – unfortunately this now gave foxes/wild dogs access to the wildlife along the river and Ian, with a neighbour’s help, needed to build a small fence at the northern end to stop their entry (there is already a fence at the southern end to stop the entry of goats from the adjoining property). The upside of this sand is that we can now walk – in gumboots! – along the river (when the tide is low) and look up at the beautiful growth of new and established plants. The gully held!!! 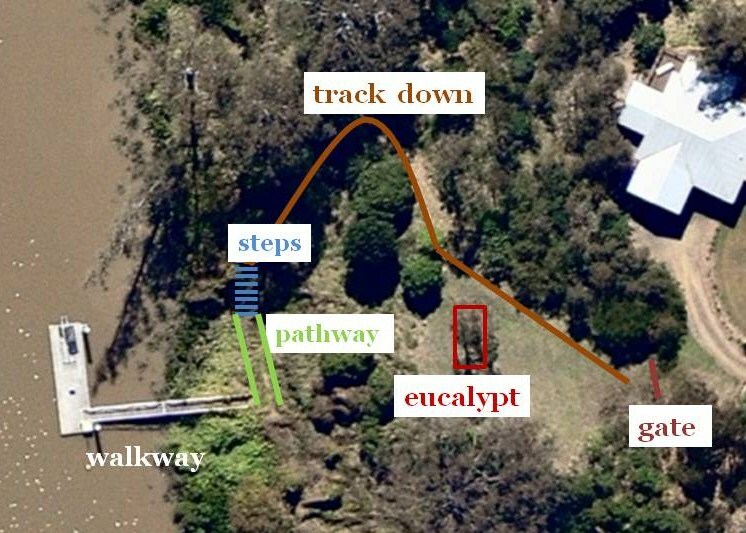 There was minimal erosion in the gully in comparison to other parts of the bank that lost considerable amounts of soil – although a deeper channel formed in the centre of the gully and a mass of branches was deposited at the two-thirds mark. This success was due to the rehabilitation efforts of Ian -the laying of carpet as well as new planting and the building of the dam (see on the Menu The Creation of a Sanctuary page and its subsidiary Preventing Erosion). Fabulous work, darling! It looks great and is interesting and informative. You are amazing!